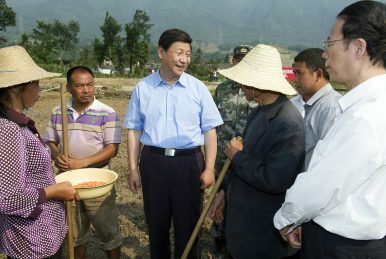 FILE - In this May 21, 2013 file photo released by China's Xinhua News Agency, Chinese President Xi Jinping, center, talks with villagers at a corn field in Qinglongchang Village of Lushan County, southwest China's Sichuan Province. China has long spoken of a ‘war on poverty,’ but recent signs suggest it might be even more of a focus in 2018. As has become his tradition, Chinese President Xi Jinping used this week’s New Year inspection tour (meaning the Lunar New Year, rather than January 1) to demonstrate the government’s focus on combatting poverty. “For the sixth year in a row, Xi’s Lunar New Year inspection tour has taken him to the front lines of China’s war against poverty,” Xinhua, China’s state news agency declared. “To lead the people to a better life is our goal. Not a single ethnic group, family or person should be left behind,” Xi told villagers during his New Year inspection tour. This year’s inspection tour was fairly routine. Chinese media coverage even borrowed liberally from descriptions of Xi’s trips to other impoverished villages in previous years. After all, China has been waging its “war on poverty” since at least Xi Jinping came to power – if not for decades. Xi’s pledge to eliminate poverty by 2020 is also not new; that’s been part of China’s definition of the goal of attaining a “moderately prosperous society” since the Hu Jintao era. Yet there are other signs that this year’s emphasis on poverty reduction, while not unique, may bring more tangible results than in years past. Though this change made fewer headlines than “Xi Jinping Thought,” also introduced in the work report, Xi was not exaggerating (at least not much) when he said the new “contradiction” was a “historic shift that affects the whole landscape and that creates many new demands for the work of the Party and the country.” In essence, Xi acknowledged that China’s previous growth-at-all-costs model was no longer meeting the expectations of the Chinese people; the time has come for a shift to growth that actively considers the all-around well-being of the population (For more on the importance of this change, see Evan Feigenbaum’s article for the Carnegie Endowment for International Peace). This is the necessary context behind Xi’s visit to rural Sichuan, and the recent government statement outlining a “rural rejuvenation” policy. China’s developmental imbalances are best embodied in the tension between the prosperous cities of the east coast and its impoverished rural inland regions. In 2011, the Economist created a map comparing different provinces of China to countries around the world in terms of GDP. The eastern coastal provinces have GDPs comparable to western European economies like Switzerland and Austria; further inland, provinces merit less enviable comparisons to Libya and Bolivia. While the numbers are outdated, the general trend remains true. The government has long recognized the issue this imbalanced development creates. The high incidence of rural poverty makes it the most urgent area of focus in China’s “war on poverty”; according to the Chinese government’s definition of poverty, as of 2015 there were 55 million rural poor out of a total of 70 million Chinese living in poverty. As part of its coverage of Xi’s New Year tour, Xinhua said that China had reduced the number of rural poor by 10 million in 2017, without providing exact figures (Xinhua claimed the same 10 million figure for poverty reduction in 2016). Ending rural poverty, however, is far easier said than done. Xi’s predecessor, Hu Jintao, also made addressing China’s developmental imbalances a major theme of his time in office; that was a key part of Hu’s signature “scientific development” catchphrase. Yet, according to Kerry Brown, “the best that can be said” for Hu’s efforts is that he was able to “stabilize” inequality during his final three years in power. Whether Xi will have better luck might be the biggest question facing China today.